Size 6 - $69.99 Only 6 left! Size 7 - $69.99 Size 8 - $69.99 Size 9 - $69.99 Only 7 left! You were born for these secret missions. Strategy is your middle name. Everyone knows it! When you walk in the mess hall your underlings jump up from their MREs and give you a hearty salute. Now, you're not heartless. You don't want people bending over backward for you but you do appreciate their actions because discipline is key to most of your plans. Your life isn't only about combat, of course. You spend some time playing games with your unit. You're a master at Risk, Battleship, and chess. And when playtime is done, it's back to the real strategy board. Your marching orders are all about staying in place and using your brain. Good thing, too, cause your boots are not made for marching. 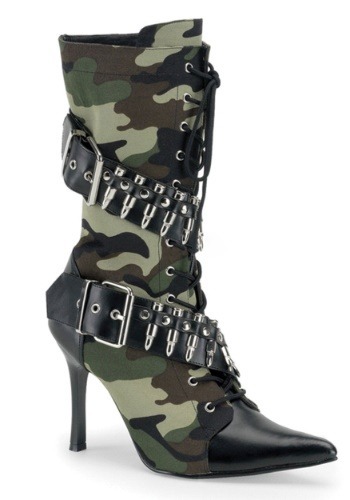 Finish off any of our gorgeous military costumes with these stand out camo ankle boots. The stiletto boots strap up the front and have a faux leather tip. A belt wraps around the ankle with rivets and bullets making them shine! These boots will go along with any branch of the military. After all, with these sleek heels, you'll pass any inspection with flying colors. Browse through the rest of our army accessories and you're sure to make your unit proud!